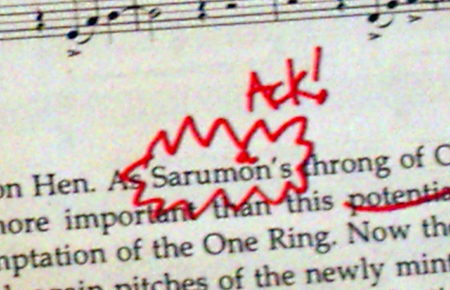 The Music of the Lord of the Rings Films: Text Locked! In late September, 2004, I received my first e-mail from Doug Adams. 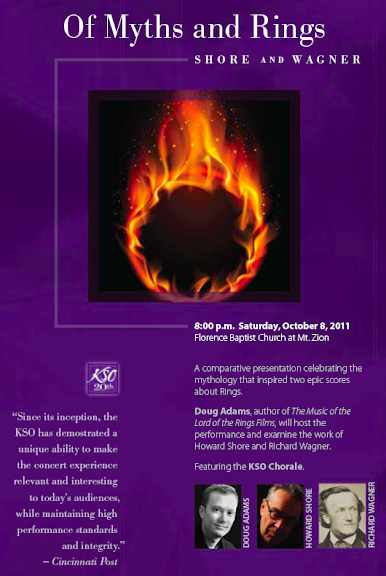 I’d recently posted, on a messageboard we both frequented, my plans to attend a LOTR Symphony concert in Chicago (I was living in St. Louis at the time). Doug was hoping to record a forum discussion with Film Score Monthly contributors, and wanted to know if I was interested in participating. I only knew Doug by reputation at that point, but I was a big fan of Shore’s Rings scores. Unfortunately, the scheduling didn’t work out. Nor was I able to make the pre-concert meeting where Doug gave interested fans a “sneak preview” of the book he was writing. I did, however, get to talking with Doug at the post-concert party. (I can claim the distinction of being one of the few people who can say they were introduced to Doug Adams by Howard Shore!) That conversation led to more e-mails, and ultimately an offer to “proofread” the early draft of the book, and to provide some general feedback. Well, here we are, almost four years later. To borrow a phrase, what a long, strange trip it’s been! The incomplete draft to which I first put red pen seems many leagues away. Since then, there have been Complete Recordings, Annotated Scores, an ever-expanding timetable and the growth of an entire online community. Finally, last month, a package arrived. A short trip to Kinko’s later, and my pen was ready to bleed ink once again. Many long hours ensued, a good deal of them spent on the phone. Journeys were undertaken. Midnight oil was burned. Pizza was ordered. Dictionaries, thesauruses, style manuals and numerous other volumes were thumbed and re-thumbed. But all things have their proper end. It is my pleasure to confirm that, as of 10:41 p.m., EST on 7/31/08, the complete text of The Music of the Lord of the Rings Films by Doug Adams is – barring the odd footnote tweak or directive from on high – officially locked. And many other things Ilúvatar spoke to the Ainur at that time, and because of their memory of his words and the knowledge that each has of the music … the Ainur know much of what was, and is, and is to come, and few things are unseen by them. Yet some things there are that they cannot see, neither alone nor taking counsel together; for to none but himself has Ilúvatar revealed all that he has in store, and in every age there come forth things that are new and have no foretelling …And so it was that as this vision of the World was played before them, the Ainur saw that it contained things which they had not thought. I also want to stress the painstaking care that has gone into the preparation of this text. The process of refining each chapter and sub-section so that they work together as a coherent whole was attended to in almost microscopic detail. This was no simple cut-and-paste job, with the odd “deleted scene” spliced in. And while it will, of course, be possible to read “in” this book, paging to the section that happens to interest you at any given time, it will be equally possible to read the book all the way through, cover to cover, without feeling as though you are traversing a patchwork landscape. In terms of new content, allow me to list a few of the things you can expect to see… A new introduction and epilogue. More “Behind The Score” moments and notated examples. Further musical observations, and yes, a few never-before-chronicled themes. 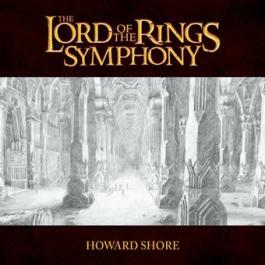 More quotes from Howard Shore, with added insight into the maestro’s creative process. A slew of graphical bonuses. Even some very subtle Easter eggs for the careful-eyed. And I haven’t even touched on the Rarities Archives (which are shaping up to be just mind-blowing) or the exciting concepts being tossed around for the probable Deluxe Edition. It all adds up to a package no fan of the scores will want to do without. 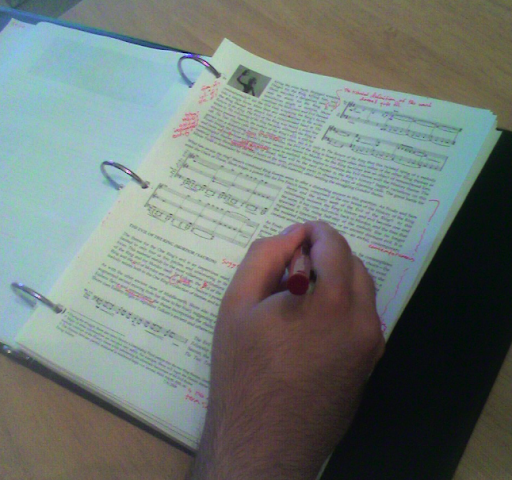 When all is said and done, the CR liners and Annotated Scores – while perfectly adequate to their intended purposes – were only a warm-up. This is the main event. Before I wrap things up, there’s one more thing I want to say, as someone who’s had the opportunity to observe Doug working up-close. Throughout this entire process, Doug’s attitude has been one of extraordinary humility and respect: respect for the filmmakers, respect for the fans, respect for Howard Shore, respect for the integrity of the story and its characters, and – above all – respect for the language and spirit of J.R.R. Tolkien. I can’t tell you how many times, niggling over some particular detail, spelling or turn of phrase, the most important question was, “What did Tolkien do?” … or how many sentences were parsed and reworked and parsed again until they were best in accordance with the vision of Middle-earth’s author, or director, or composer – or all three! I’m certain the book is not perfect; it will not please everyone, and mistakes will no doubt be found. But it won’t be for lack of care. Doug’s been very aware that he’s not just stepping into a void here, but into a tradition of attentive craftsmanship, one which he’s taken great pains to honor. Doug will be the first to tell you that he thinks of himself as a musician, not a writer. But the true test of a writer is to write, and the bottom line is that Doug has written one heck of a book. His passion and dedication are apparent on every page. I consider myself extraordinarily privileged to have read it … and I can’t wait to share the experience with all of you.